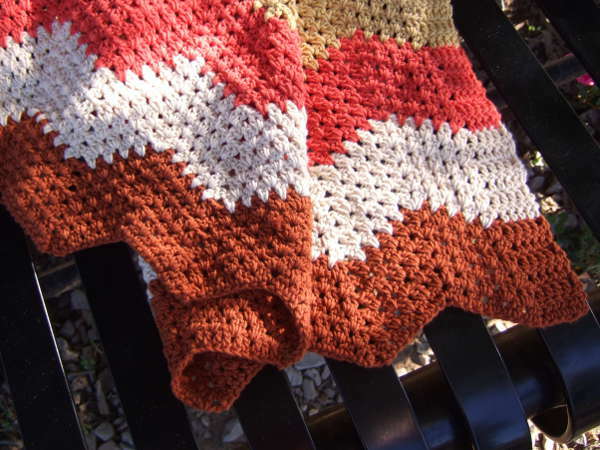 Love this pattern.. Just ripped out the Afghan I started this a.m. and going to do this beautiful pattern. It could be a while before I have time to make a video. I have a video for a shawl with this same stitch. Although the edge is different and it only has “peaks” and no “valleys”, it might still be helpful to see how the stitch works. Thanks for this neat pattern. Can’t wait to try. I appreciate the ability to download the PDF! Tried to begin this pattern but don’t seem to get the holes to line up. What am I doing wrong. Can you send me a picture or describe more of what is going on? In general, the peaks are the ch-1 spaces and should line up vertically. The valleys are formed by a skipped space between two “checks” where a check is not made. These should also line up vertically. At the beginning and end of each row, a check is skipped which forms the half-valley of the edge. I was wondering were I can find the Baby Train Track blanket. Making the train track hat and I love it! Its really nice to find patterns for straight needles! I believe row 2 of this pattern is written incorrectly. What part of it needs correction? I, too, am having trouble with row 2. It just doesn’t work out right the way I read the directions. For me, the problem is with the beginning and ending stitches. I think I have it figured out though. I still have to rip it out and do it over. If I am successful I will offer a correction. My apologies to “Mama”. I cannot come up with an improvement on the directions for row 2. I think I’ve got it right and am proceeding with the project. It might be helpful to point out that when you cross the “valleys” you are actually skipping 4 dc. This is a little confusing because the repeat section, “**”, both starts and ends with “skip 2 dc”. It does work though! A minor correction I might suggest in second to last sentence should read “Repeat from ** across ‘to’ last 4 dc and turning chain,”. One should also keep in mind that the dc and crossing the “holes” at the beginning and end of rows is done differently than the rest of the row. Any way, I feel I am on the right track now. I’m using this pattern to make a “prayer shawl”, something I often do to “try out” afghan patterns. Should go pretty fast—wish me luck! Excellent suggestions. I made those changes to the pattern. Thanks! I want to make this granny sq. zig zag afghan and it will be about 72 inches by 56 in. I am using 4 colors. Can u tell me how many 8 oz skeins l will need for each color ? That would be like the large size given in the pattern. The large size calls for about 203 oz of yarn total so about 51 oz of each color for four colors. That would be 7 skeins of each color. I am using the no chain foundation row method. Sns I want my blanket to be approx 60″wide. Can you tell me how many spaces I’ll have to make to get the granny ripple to be approx 60″ wide? Start with 327 chains. It will take about 14,600 not counting any edging you want to add. For the edging just be careful about the peaks and valleys on the top and bottom. I think too much of an edging would detract from the ripple, so maybe just a simple sc edging or a sc, 3-ch or a chain and picot edging. Changing yarn weights is hard and something I just do my best using experience to try to estimate. If you are using the same yarn weight and hook size as the pattern calls for, you can use ratios to scale up or down. Also as long as the pattern gives more than one size, you can use the difference in the beginning chains to get the “multiple” of the pattern. That will be an amount you can safely add or subtract from the beginning chain amount to size up or down. The 327 chain already includes the plus 12. 21 times 15 is 315. Adding 12 gets to the 327. You will be skipping 4 dc in the “valleys”. These stitches are then made up in the peaks. This should work out to be the same number of stitches on each row. You have some of THE most beautiful patterns, and I am very grateful that you so generously share them. This one is absolutely gorgeous and I cannot wait to make it! About this ripple afghan. You had one in a boucle yarn green and white. I am looking for this kind of yarn in a different color but cannot find it.Can you tell me where to buy it. I tried Sensations rainbow boucle but no luck. hello. I will be doing the medium design. how long would this pattern take verbatim? I have two weeks to complete. Everyone goes different speeds and works different amounts of time a day on their projects, so I can’t say exactly, but I can say this is a very fast pattern. Once you have your first row set, the rest of the rows follow the same pattern. Since you are making the checks into spaces between stitches instead of in the loops at the top of stitches, you gain a lot of speed not having to go in the correct loops.